Keeps Smokers Happy at the Royal Oak, Car Colston. The Royal Oak lies at the heart of the village of Car Colston, Nottinghamshire and serves real ale and a range of traditional food. 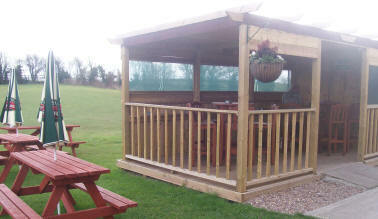 Like all pubs, the Royal Oak has had to adapt to the new laws surrounding the smoking ban and has installed a smoking shelter in the rear beer garden. As the law requires a minimum of 50% open sides to a smoking shelter most heating solutions will not work in such an exposed environment. By installing two 1.2kW heat and light units, specified and supplied by Leisure Heating Ltd, the smoking shelter now has an energy efficient heating system that heats people directly. The heaters are designed to give an optimum level of comfort for customers throughout the whole year and whatever the weather. 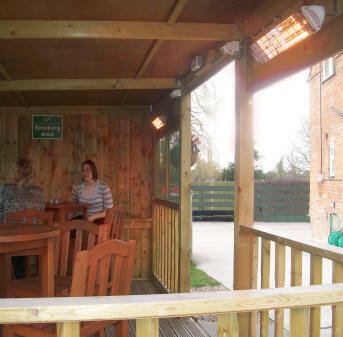 The use of energy efficient Infra-red heating in conjunction with movement detectors has allowed the Royal Oak to use the most efficient way of heating people outdoors. The heaters have the ability to heat people directly and not the air in between. This makes them up to 80% more efficient than equivalent gas patio heaters. Infra-red heating is based on the transfer of thermal energy by electromagnetic radiation. Infra-red emitters are classified according to the temperature dependent peak wavelength which they emit and can be short-wave, medium-wave or long-wave. detectors or with power controllers.